TWO ACRES ON THE RIVER! 1000 sq. ft. of HEAVENLY, HOMEY, COMFY, COZY includes 1 bedroom with propane fireplace, 1 3/4 & 1 1/2 updated baths (1 w/laundry), lovely living area with fireplace and sweet upgraded galley kitchen with new garden window. Big den/sunroom looks out on the river and those beautiful cliff walls and giant cottonwood trees that make Jemez Springs so special! New doors & windows! Nice patio & brand new deck WITH A HOT TUB for sipping wine, listening to the river babbling by and watching the Milky Way swirl! Furnishings & appliances stay!! Brand new 2 car garage with custom shelving. This delightful property lies within the Village limits so comes with City Water and Sewer! Comes with IRRIGATION RIGHTS too! New, high grade coyote fencing for privacy! BETTER GET IT QUICK!! Please, send me more information on this property: MLS# 939876 – $325,000 – 15787 Highway 4, Jemez Springs, NM 87025. 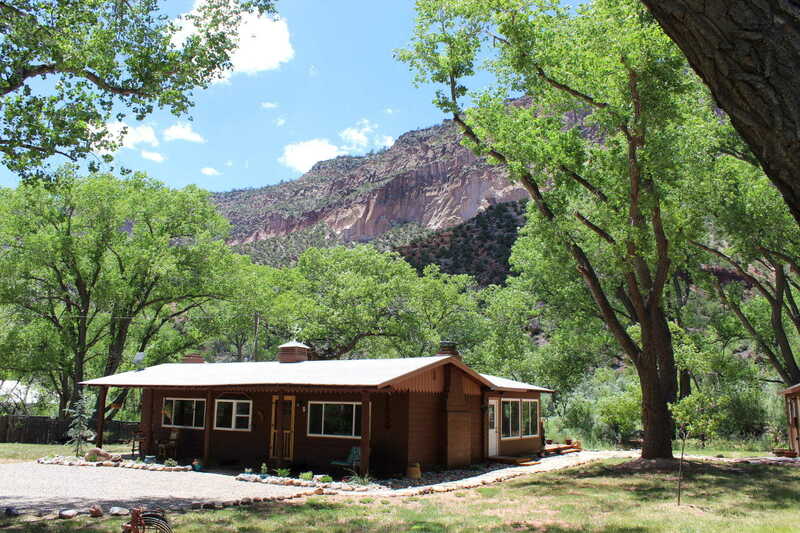 I would like to schedule a private showing for this property: MLS# 939876 – $325,000 – 15787 Highway 4, Jemez Springs, NM 87025.